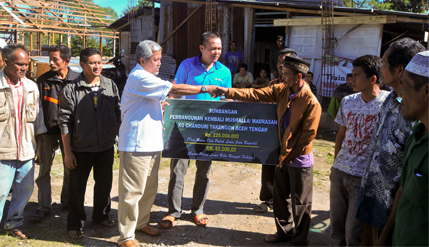 ACEH TENGAH, Indonesia, 30 May 2014 – The National University of Malaysia (UKM) has again led a humanitarian mission to lend assistance to four villages here badly affected by an earthquake in July last year. The 6.7 Richter scale earthquake had destroyed houses, public amenities and infrastructures of the villages including the mosque at Kampung Blang Mancung where six children who were waiting for their Quran class lost their lives. Altogether 38 people from the villages died in the earthquake. The Selangor Zakat Board and TV3 joined in the mission to the villages of Kampung Cangduri, Kampung Blang Mancung, Kampung Bah dan Kampung Srempah in Mukim Ketol here. The UKM delegation was led by the Community Relations Department and include representatives from Corporate Communications Centre (PKK), Bursary and Zakat Unit. Members of the mission took 14 hours by road to reach the villages from Banda Aceh and had given out donations of 225 million rupiahs (RM65,000) to help build a madrasah at Kampung Canduri which costs around RM100,000. The madrasah will be used as a mosque and community centre. The Selangor Zakat Board presented 300 bags of rice to villagers in the four kampungs. TV3 will air activities of the delegation and appeal for donations to help rebuild the Kampung Blang Mancung mosque.